in Aningeje, Akampka local government area, Cross river state, South- south Nigeria. 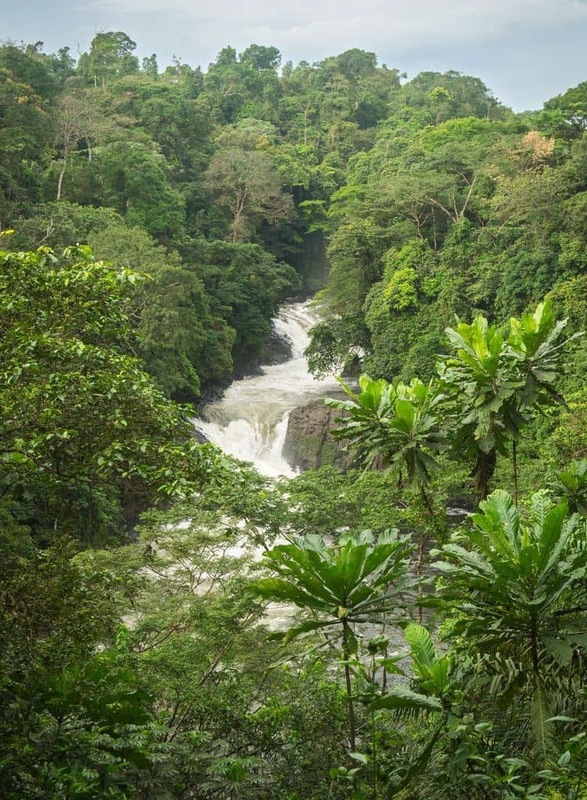 Kwa waterfall is located in the Cross River National Park and the waterfall derives its source from the Kwa River not too far from Calabar, the state’s capital. Not your typical waterfall. It is a river on a layered descent of a steep, winding gorge through a rainforest in Aningeje, Akamkpa LGA (via Calabar), Cross river state, Nigeria. This vista is a visitor’s first glimpse of the falls (or rapids in this case) before meeting its turbulent flow in the valley with the help of some 234 guiding steps. The sound of the falling water from this vantage point is very soothing; a muse for meditation. And the rainy season view, as you’d agree, is exceptional. Tony and I came a long way to have a spectacle of a stream of water cascading over a long winding slope of craggy rocks, but instead we found this rapid with flooded banks. This is mid-August, around the peak of the rainy season. There was no spectacle, almost nothing better we could think of than cooling off. After getting permission from the tour guide on standby, we get down to shorts, and into the flowing water. It has been reported that this destination, due to its very rugged terrain, has the more accident casualties than any other tourist site in the state. Hence, caution kept us from going the extra mile- we kept close to the bank.